Travel without pulling your hair out from stress or spending too much money by purchasing a motorcycle tow caddy from MagnetaTrailers.com. 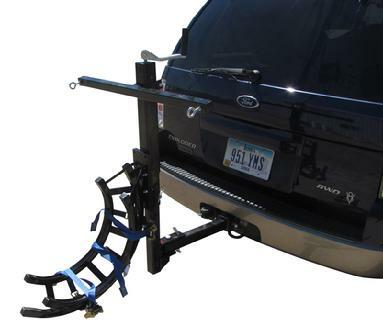 Our company offers a variety of caddies that are easily attached to your standard car or receiver hitch. 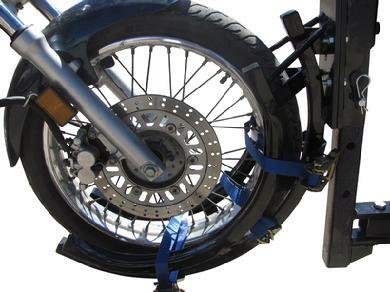 They feature an adjustable motorcycle towing cradle that attaches to the front wheel of your cycle. For your peace of mind, the motorcycle tow hitch comes with a heavy-duty grip that makes sure your motorcycle is properly fastened. Our hitches are available in a variety of sizes. You can purchase a motorcycle tow hitch for your standard car or truck, as well as your RV or camper. 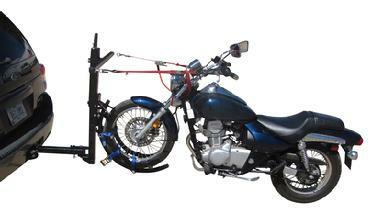 We offer a motorcycle tow caddy that swivels, which is perfect for bigger bikes, choppers, and trikes. Purchasing a hitch is one of the most safe and economical ways to transport your motorcycle long distances. 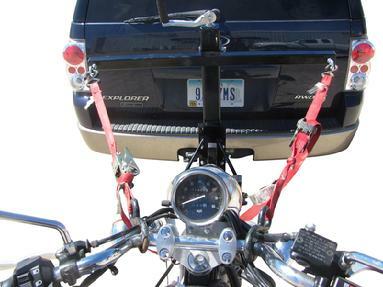 Place an order for a motorcycle towing cradle today and start traveling with your bike today. THE NEW MOTORCYCLE TOWING CADDY NOW SWIVELS SO IT WORKS BETTER WITH BIGGER BIKES, CHOPPERS AND TRIKES AND TOWS BETTER BEHIND RV'S AND CAMPERS! 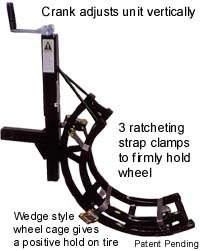 THE NEW CADDY ALSO INCLUDES A CLAMP ON SPREADER BAR WITH TIE DOWN LUGS, MAKES FOR EASY AND FAST TIE DOWN! * Unit fits std. 2" / class #3 & #4 Receiver hitches. * Unit has built in jack. cranks down for loading at ground level, and cranks up and locks for road travel. * Front tire wedges in the V shaped wheel cage and holds bike upright for you while you tie it down. wheel cage 1 1/4" x 1 1/4" square tube. * Hitches lower than 12" will require an lifting adapter. PRICE $ 795.00 FREE SHIPPING INSIDE THE U.S.A.
PRICE $ 695.00 FREE SHIPPING INSIDE THE U.S.A.